Facing a long, boring wait for his next playoff game, Dirk Nowitzki did what he normally does. He went to the gym. There were daytime sessions with his Dallas Mavericks teammates, of course, but also return trips at night. Knowing a chance for a return trip to the NBA finals was coming up, Nowitzki wanted to make sure his wide array of shots were as fine-tuned as ever. When the Western Conference finals opened Tuesday night, Nowitzki acted as if the Oklahoma City Thunder and the 20,911 fans in the arena were merely there to watch another of his late-night workouts. Inside, outside and from the foul line, Nowitzki put up a total of 39 shots and missed just three. He scored 48 points, leading the Mavericks to a 121-112 victory and answering any question about whether the long layoff might've left his club rusty. "I really looked for my shot early and was able to get a good rhythm," said Nowitzki, who also had six rebounds, four assists and four blocks. "For a shooter, obviously when the first couple go in, that's even better for the confidence, and I just attacked from there. So, yeah, it was a good game." It didn't matter whether Nowitzki was being covered by someone big or small, one guy or two. He simply made 10 of his first 11 field goals, and 12 of 15 overall. He was perfect on 24 free throws, setting an NBA postseason record for most foul shots made without a miss. His 48 points were the most by anyone this postseason. It was two shy of his most ever in a playoff game, which came in the finale of the 2006 Western Conference finals. The Thunder better figure out a way to slow him soon, or else Dallas will be headed to the title round again. "We feel like every year, every new season in the playoffs is a new opportunity for us," said Nowitzki, still stinging from blowing a 2-0 lead in the 2006 finals. "We're just trying to go for it." The Mavs have won seven straight playoff games, stretching a franchise record. They're also 6-0 at home this postseason, and will host Game 2 on Thursday night. But give Oklahoma City some credit. Two days removed from ending a tough second-round series against Memphis -- it went seven games, plus four overtimes -- the youngsters were down by 16 points early in the fourth quarter and didn't give up. They got within five with 3:42 left, and six with 48.5 seconds to play. "We fought back and made it a game," Thunder star Kevin Durant said. "We've just got to keep pushing and stay positive and get ready for Game 2." Durant scored 40 points, one shy of his most ever in a playoff game, but it wasn't the same as Nowitzki's big night. He made his first six shots, just like the big German did, then made only one of his next seven. By the time Durant regained his touch, the Mavs were way ahead and the Thunder were clawing back. Oklahoma City could've used a more efficient performance from Russell Westbrook. He scored 20 points, but 14 came on free throws. He missed 10 of his first 11 shots, and 12 of 15 -- the exact opposite of what Nowitzki made. "He was attacking the basket," Thunder coach Scott Brooks said. "That's what we want Russell to do." Their bigger problem was Nowitzki. Six guys tried to guard Nowitzki, and he either shot over them or put them in foul trouble. He made 13 free throws in the third quarter alone. Brooks came into this series unsure how to approach Nowitzki because his longtime first choice to cover him, Jeff Green, was traded in February. Serge Ibaka started against Nowitzki, got two quick fouls, and was replaced by Nick Collison. Kendrick Perkins, Durant, Thabo Sefolosha and James Harden all took turns with little success. "He was hot," Ibaka said. "It's tough. You can't get frustrated. I'll watch the film and we'll come back the next game." On one of those plays when Ibaka used his 7-foot-4 wingspan to shield Nowitzki's view of the basket, the former MVP went to his one-legged, step-back jumper and saw the ball go off the rim, against the backboard, off the rim again and then drop through the net. On the series when Nowitzki missed for the first time, a teammate got the ball back to him, and he found Tyson Chandler for a layup. On the few times a second defender ran at him, he passed to the teammate left open; that's what set up Jason Kidd for his only basket, a 3-pointer. And in the final minute, Nowitzki passed to Jason Terry in the corner for a 3-pointer that sealed the victory. "We can't get discouraged," said Durant, who was whistled for two fouls against Nowitzki in a 5-second span during the third quarter. "He's going to make shots. He's going to make off-balanced shots with a hand in his face." Oklahoma City was careful to avoid any fine-worthy comments about the officiating, but players made it clear they didn't like all the calls Nowitzki got. 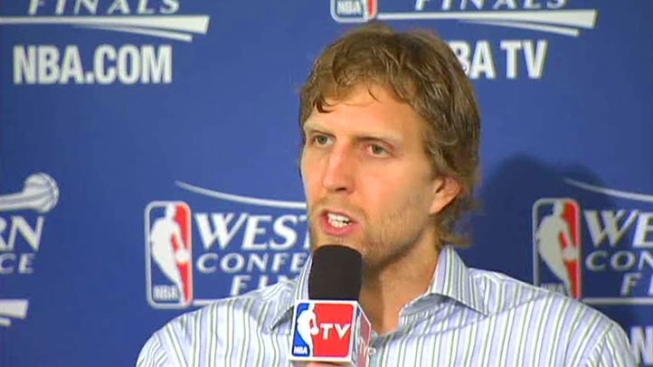 Then again, Nowitzki noted that the Thunder got to the line more than Dallas did. Durant was 18 of 19 on free throws and Westbrook was 14 of 18. "After playing a physical series with Memphis, I think we were a little too physical with him," Durant said. "We have to make adjustments, be smarter. It's a learning experience, just feeling it out and seeing how we're going to play." Terry scored 24 points and J.J. Barea added 21 as the Mavericks picked up where they left off in a sweep of the Lakers nine days before. They broke open a tight game with a 13-0 run late in the second quarter and never trailed again. The Thunder led by nine points early in the second quarter, then went 6:28 between baskets. Oklahoma City missed 10 shots during that drought and was down by 11 when it ended. Perhaps it's a small consolation, but Oklahoma City scored more than anyone had against Dallas this postseason -- by 15 points. "They're going to continue to play that way," Terry said. "For us it was very key to get this one. Now the next one is very big." Notes: Dallas' Shawn Marion scored 11 points, despite being floored by an inadvertent elbow from Perkins to his nose. The trainer cleaned up Marion quickly and, with a plug of gauze up his right nostril, he was part of 13-0 run that followed. He even scored the go-ahead basket on a dunk. ... After tying a playoff record with 20 3-pointers in its last game, Dallas missed its first six tries from behind the arc. The Mavericks finished 9 of 23 on 3-pointers. Terry was 4 of 8 after making 9 of 10 in the close-out game against the Lakers. ... The playoff record for free throws without a miss was 21 by Boston's Paul Pierce against Indiana in April 2003. ... Only Bob Cousy has ever made more free throws than Nowitzki had. The Boston star made 30 in a four-overtime game in 1953. Nowitzki's 19 free throws in a half tied a record held by Magic Johnson, Karl Malone and Charles Barkley.